The Model 138K is Steingraeber’s largest concert upright piano, with an acoustic equivalent of a 180 cm (6ft) long salon grand piano. It was awarded the ‘world’s best’ prize for uprights in Paris. The Model 138 is often chosen by universities, small concert halls, conservatoires and churches in preference to the larger grand pianos taking up less valuable space. The model 138K is equipped with the enhanced chamber music dampening for the single strings sections. Other options also available are a sostenuto pedal, and an enhanced chamber music dampening for the two string (bichord) bass section. Casework comes in either the K (Klassic) finish, the B (Baroque) finishes and many others, even to your own personal design. The tone is superbly rounded, being particularly powerful in the bass, normally characteristic of larger pianos. 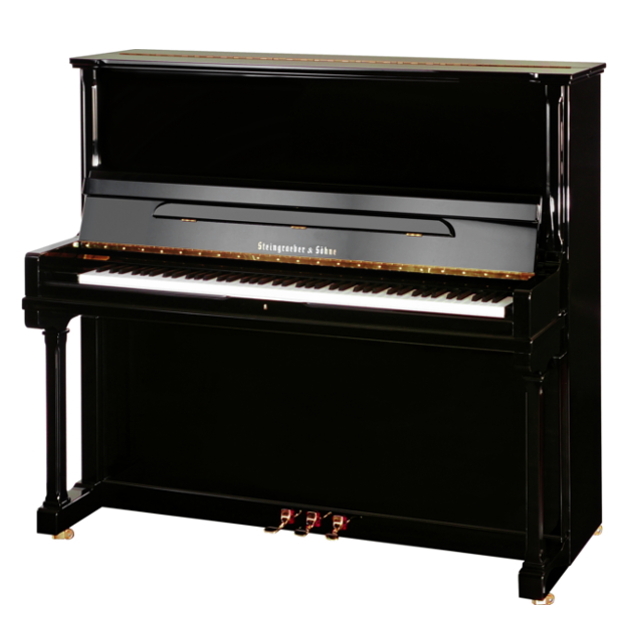 The action is designed to satisfy the most demanding pianists and the touch of the piano will respond to the subtlest nuance, for all styles of play. Although less widely known than the biggest names in the piano world, the Steingraeber 138 is one of the finest instruments in the world. The Steingraeber name is a well-kept secret which should be brought to the attention of more discerning pianists, and anyone who wants to experience the best and most refined pianos ever made. Upright models available 120, 130 and 138 cms (image above is the 130 model).